If you have suffered harm as a result of a radiology error in Baltimore, look to the Law Offices of Cardaro & Peek for help. Just like all other medical professionals, radiologists can be held liable for medical malpractice. In many cases, an accurate diagnosis depends on the timely interpretation of radiology reports and failure to do so could put the patient’s life at risk. If you have suffered harm as a result of a radiology error in Baltimore, look to the Law Offices of Cardaro & Peek for help. 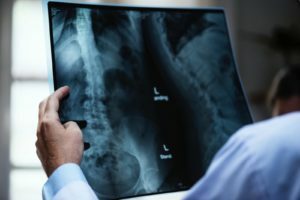 According to the Physicians Insurers Associates of American, between 1985 and 2002, radiologists were responsible for the sixth highest number of medical malpractice claims. Common examples of radiology errors include but are not limited to: misread x-rays, excess radiation, delayed x-ray diagnosis, misreading a patient’s results, and diagnostic errors. Even the slightest radiology mistake can lead to a misdiagnosis or delayed treatment of a condition. Failure to read a radiology report correctly or neglecting to administer an x-ray diagnosis can lead to serious medical conditions, complications, and in some cases unnecessary surgery. The consequences don’t just carry significant medical burdens but can also be extremely costly for loved ones and their families. Most states, including Maryland, allow victims of medical malpractice as a result of radiology errors to recover damages. Economic damages are designed to compensate an injured patient for out-of-pocket expenses such as lost wages and rehabilitation costs. If the medical malpractice is severe, plaintiffs may also recover non-economic damages resulted from pain, suffering, loss of enjoyment, and more. Do not attempt to recover damages without the help of an experienced attorney. At the Law Offices of Cardaro and Peek, our attorneys are committed to fighting for the maximum compensation available to you or loved ones. It’s important that you speak with knowledgeable lawyers who have experience handling stroke misdiagnosis cases. If you believe that the medical professional responsible deviated from the appropriate standard of care, do not hesitate to call the Law Offices of Cardaro and Peek. This entry was posted on Wednesday, November 21st, 2018 at 9:22 am. Both comments and pings are currently closed.